For some mothers, providing their guests with more than just a gift is important. They want to create gifts that will allow their guests to remember loving memories with real sentiment for the many years to come. If you want to give your guests more than just a gift at your baby shower, then you are probably looking for memorable baby favor ideas that won’t be easily forgotten. Intended to create or invoke memories, these great shower favors can be used during or after the party, depending on your guests’ preference. Guests can really create lasting memories with these favors. Multiple designs are available, including balloons, letters, baby feet, and even rubber ducks. On the camera, you can also declare to your guests the gender of your little bundle of joy. They are definitely one of the more expensive memorable baby favor ideas for your baby shower, but the memories will last a lifetime. Guests will think of you and your little one every time they write. With these personalized shower pens, your guests will also have a wonderful gift to show off to their friends and family. They can be decorated with a wide variety of themes. A small window inside of the pen that turns as the pen is clicked can also be personalized with baby’s name, your name, a message, or your baby’s due date. Just like the shower pens, your options are practically limitless with these adorable favors. Pink or blue teddy bears, round buttons, onesies, and bows are just a few of the options offered to you. 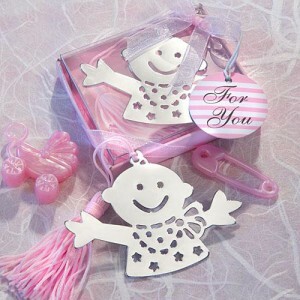 Guests can use these memorable baby favors for photos taken at the shower or to hold a photo of your baby once he or she arrives. If your guest list is full of readers, you may want to consider these cute baby favors. Sturdy book clips feature a number of different charm options. Sheep, cows, teddy bears, and babies are just a few of the options offered. These great memorable baby favor ideas for your baby shower also come packaged in small boxes, complete with ribbons and personalized gift tags.